The Canadian writer, editor and publisher discusses her work on Prairie Comics Festival, Bedside Press, Secret Loves of Geeks and her latest Kickstarter. Nicholson first received notice for spearheading the republication of Canadian comics like Nelvana of the Northern Lights and Brok Windsor. She’s a consulting editor on Margaret Atwood’s Angel Catbird graphic novel series, which is being published by Dark Horse. Nicholson also edits and publishes a wide range of anthologies including Moonshot, Enough Space for Everyone Else, and her current project, Gothic Tales of Haunted Love. Hope, how did you start working in comics? I started working in comics as a producer on a documentary about comics in about 2011 officially. I had been developing ideas in the field since 2009. I became a comics publisher in 2013. The first books that you worked on were reprint books like Nelvana of the Northern Lights and Brok Windsor, which were these old Canadian comics. 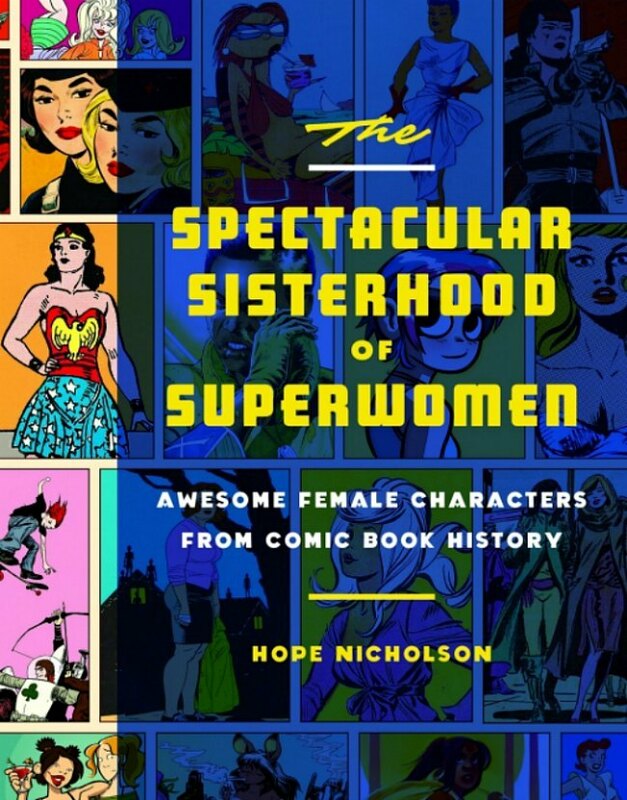 How did you end up uncovering and looking into this hidden corner of comics history? I had first heard of them in university when I was researching Canadian media products. I was immediately interested and wanted to read them and eventually tracked down microfiche. This led to making a film about them, then eventually publishing them! How have your plans for Bedside Press been evolving since you started it? I hope to keep publishing books each year. Ideally it would be enough to keep me sustainable as well as the projects, so that’s the goal. I like the people I have been working with and I’d love to keep doing more projects, doing some anthologies but hopefully commissioning full length graphic novels as well. I look at a lot of the work you’ve published – and edited elsewhere – and you’re very interested in publishing different voices in different approaches, bringing back work into print and showcasing what’s ignored or forgotten. I think comics works from the top down. I hire creators I really like to work with, and because of that, and because they’re voices not often seen, the material ends up being diverse. If it’s ever a choice, it’s more important for me to hire creators who are from different backgrounds than to publish content featuring characters that are. I also was a student for many years, and wanting to study comics, there was a frustrating lack of material on certain comics. I seek to do reprints with an eye for what I would have wanted to study and what is not available. One of the books that you work on which you are not publishing is Angel Catbird and I have to ask about how that came about and what it is like working with Margaret Atwood? She knew about my history with comics and approached me for advice on how to bring her idea to life. We discussed artists and publishing strategies and it developed from there. 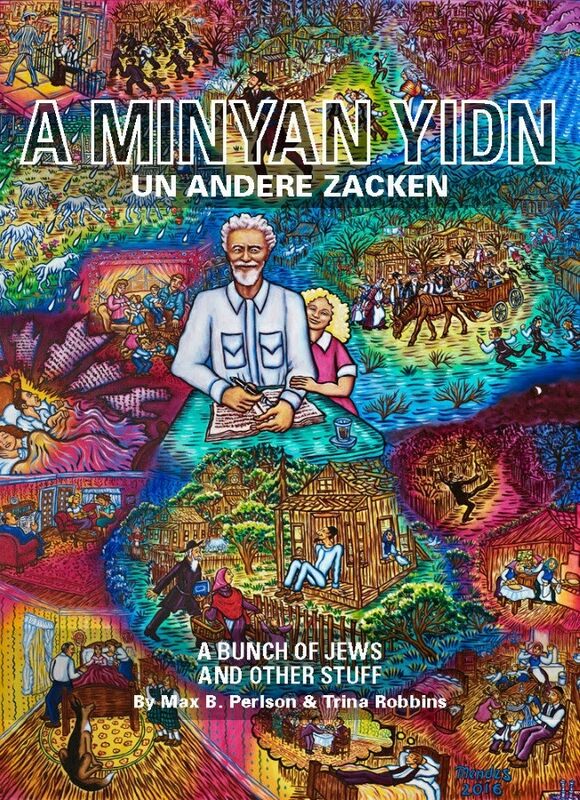 One of your books this year is A Minyen Yidn. How did you end up publishing the book and what has it been like working with Trina Robbins and this lineup of artists? Trina approached me at SDCC with the idea for her book and we went back and forth. By and large the whole project was curated and organized by her, I just did the back-work of crowdfunding, publishing, and distributing. It was really nice to work with Trina, she has a very keen eye for artists who I’d likely never get to work with otherwise. Secret Loves of Geek Girls has been a success and you did a redux of that book and now you have Secret Loves of Geeks coming out next year. It was important for me to do an edition of the book that wasn’t limited to genders. The first book was a way of saying “there are enough women to do a full book, and many more” and the second book is about saying “but there aren’t just two genders.” So there are men and women, cisgender and transgender, and non binary creators in the second edition. The redux was because I missed working with a lot of people from the first book and had an unexpected opportunity to work with them again, so I was eager to jump at it. You have a kickstarter going on right now for a new anthology, Gothic Tales of Haunted Love. What is the book? Gothic Tales of Haunted Love is my big 2017 project. Lately I’ve been aiming to do both big budget projects (full colour, lots of creators) and smaller, curated projects that are maybe closer to zines. 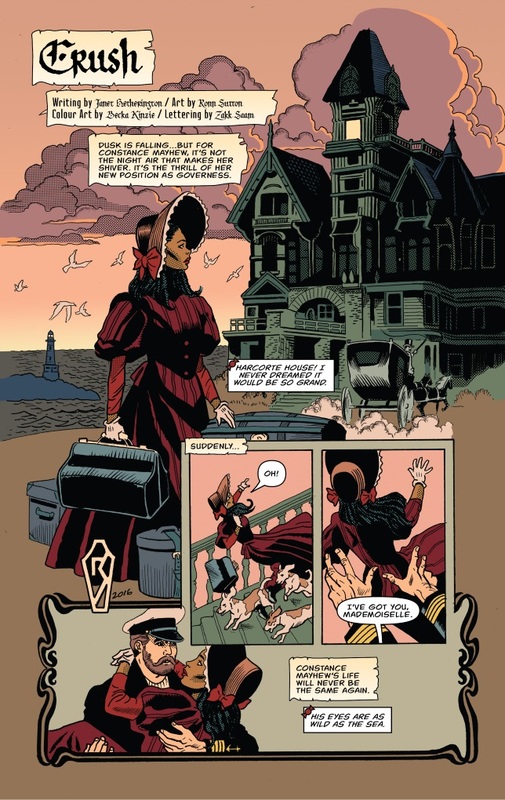 Gothic Tales of Haunted Love is my loving tribute to the 1970s subgenre of comics, but refreshing it with modern creators. My next book is coming out in a month and is called Window Horses, and it’s a full length colour graphic novel by Ann Marie Fleming and selected artists about a young Persian-Chinese poet who discovers the beauty of poetry and the secrets of her estranged father when she visits Shiraz, Iran. Do you want to say a little more about Gothic Tales of Haunted Love? When people hear gothic romance their brains might go to Jane Eyre, but that’s not exactly what you’re doing. It is and it isn’t Jane Eyre-ish. The comic genre of gothic romance is more heavily influenced by television such as dark shadows than it was from literary classics. Because of this, there is a lot of dark lords and virtuous maidens, but there are also a lot of monsters and supernatural elements. So some of the stories will be a straight up gothic romance full of rich families with deadly secrets, and others will be ghostly love affairs. For example “Crush” by Janet Hetherington and Ronn Sutton is a straight up gothic romance, no supernatural elements at all. 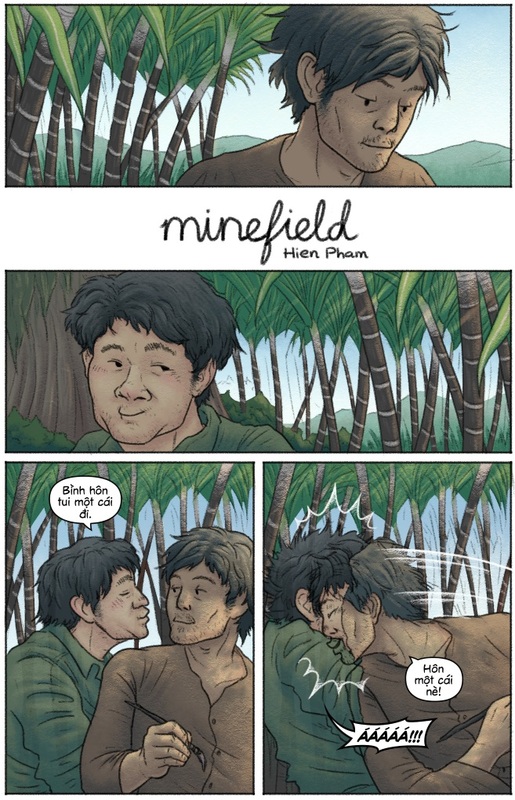 But “Minefield” by Hien Pham has no manors or maidens, but it’s a sweet and slightly sad story of a man in love with the ghost of a farmer. It’s also a story that we chose to publish untranslated from Vietnamese, with English readers able to tell the story through the action of the characters. You run the Prairie Comics Festival in May. What is the comics and art scene like in Winnipeg? The comics scene is fairly scattered, by doing the Prairie Comics Festival, I’m hoping to forge more connections between creators of all different formats. Whether they work with experimental mini-zines, webcomics, print comics or comic colouring. The comics community as a whole I’d say is more literary comic focused than other cities with Portage & Main Press our largest local publisher focused on publishing Indigenous comic books only. So it’s very different than other cities! The art scene is much different and more tightly woven, I’m not as familiar with it as a whole. One of the things I would like to see change about the city is more connections between the local shops and creators. Most of the creators have signings and events at bookshops instead of the comic book stores, and I’d like to see that changed and have a more community atmosphere between retailers, creators, and fans.